This page entitled “Special Patinas” is an except from the book “Japanese Patinas” written by Eitoku Sugimori. 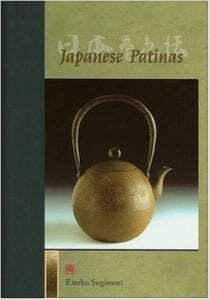 This is a list of Japanese Special Patinas. Wara-ibushi patina is used to achieve a dark brown-to-black color over a base of niage or su-tanpan patina. The first step in the process creates a sticky layer of tar on the prepared metal object, and the second step deposits soot that is bound by this layer. This description follows the traditional method, but it is also possible to create the soot in several ways. Pour oil (motor oil, olive oil, peanut oil, etc.) into a small dish that is sitting on a heat resistant surface. The size of the dish and amount of oil will depend on the size of the object. Ignite the oil and hold the work in the smoky flame to coat it with soot. It is also possible to create soot with an oxy-acetylene torch. Reduce the proportion of oxygen (“starve” the flame), perhaps even to the point where you are burning the fuel gas by itself. This will create a lot of soot, both on the work and in the air, so it is best to work outside. Make an enclosure of bricks or stones and set up charcoal pieces to create a slow-burning fire. Light with paper or lighter fluid to get the fire going. This step is similar to backyard grilling. Place a bundle of straw on top of the burning charcoal to produce smoke. Hold the metal object over the smoke, close enough that you are depositing a thin layer of tar on the surface. While applying the tar, keep the flame low to produce as much smoke as possible. Usually the work is held on a stick; when the shape of the piece does not allow this, place the piece in a wire net and set on top of the straw bundle. Turn the piece constantly as the tar layer develops. If ash or dust adheres to the surface, push it gently away with a soft brush. Once the surface has been covered with tar, increase the flame size by blowing on the charcoal or using a bellows. This will make a lighter, voluminous smoke. Hold the work in the middle of this smoke to apply a layer of soot. If the flame gets too big during the smoking process, you can place a wood block on top of the flame to smother it and produce more smoke. Keep in mind that soot occurs in the center of the flame, so you will want to locate that area to apply soot onto the object. Repeat the process until you have achieved the desired effects. Cool the work and gently wipe the surface with a soft, dry cloth. Safety Note: Work outdoors or in a well-ventilated place. This process produces a lot of smoke, therefore, a mask or respirator is recommended. In the nuri-iro patina, a thin layer of Japanese lacquer ( urushi ) is applied to the metal to glue soot onto an object. This patina is applied onto a base coat of niage or su-tanpan , resulting in a glossy black surface. Urushi is the sap of the urushi tree, a member of the poison sumac family. The sap, when exposed to the atmosphere, hardens, but also has extremely irritating affects when coming into contact with skin (like poison ivy only worse). When handling urushi , rubber gloves are essential. The following process also requires the heating of urushi , of which the evaporating steam and smoke should not be inhaled. You must wear a respirator when applying this patina. Apply a thin coat of urushi onto a metal object that has been prepared with a base coat of niage or su-tanpan. Conventional lacquer can be used but urushi is preferred because it is very durable. Use the process described above to deposit a layer of soot onto the still-wet lacquer. Hold the freshly painted piece into the smoke of a slow-burning bundle of straw. When an even layer of soot has been created, warm the work with a torch flame. The goal is to evaporate moisture from the lacquer while softening it just enough so that the soot sinks into it. Allow the work to cool. Clean with a damp brush to remove any soot that did not adhere to the lacquer, then dry with a soft cloth. If necessary, repeat the process until the desired color is achieved. After drying, apply wax to seal the patina (see page 67). This process (translated as “painted copper”) does not fit into our usual definition of patina, but it is closer in concept to the surface we use on our cars. A high quality lacquer is colored with pigments, then carefully applied. Originating in China , iroe -do was popular in Japan for a short time at the end of the Edo period. Though commercially-made lacquer can be used, urushi is valued and favored for its strength. This is a final finish that is applied once the piece has been polished. In separate dishes, make a few different lacquer mixtures using urushi and pigments. These should be thinned to make a paste that can be painted on with a brush. Apply the colors with a high quality brush, then allow the work to air dry. It is critical that no dust is in the environment; set the work in a closed box that will allow air to enter but keep contaminants out. A frame with fabric panels is useful. When the urushi is dry, polish the surface, then seal it with wax or clear lacquer. Safety Note: To protect against skin irritation caused by contact with urushi , always wear rubber gloves when handling the lacquer. Ryuka patina is used to create a gray, dark gray, and black patina on silver and copper alloys. It behaves in a way similar to liver of sulfur, a compound familiar to metalsmiths in the West, who use it to color sterling, fine silver, and copper. In effect (though not in chemistry), ryuka is similar to gun bluing, a commercial product that can be used to create a gray and gray-brown on bronze. Mix up a quantity of this solution in advance, then add a small amount to warm water as needed. Ryuka patina creates a black patina on copper, brass, and silver. Combine the dry ingredients and grind them to a powder. Bring the liter of water to a boil in a stainless steel pot, and add the dry mixture. Stir thoroughly. Let the solution cool, then transfer it to a glass or plastic container for storage. Mix one teaspoon (5 ml) of ryuka concentrate into one liter of hot water. Stir until completely mixed. Warm the piece (for instance, with a hair dryer), then immerse it in the ryuka solution. Once the piece has blackened, remove it from the solution, rinse thoroughly, then dry with a soft cloth. Polish with baking soda until the desired finish is achieved. Apply lacquer to seal and preserve the color. A similar effect can be obtained by applying the ryuka solution directly onto the surface with a cloth. Different results can occur depending on the strength of the solution, so for consistent results it is important to keep the ratios of solution to water the same each time. Furubi patina is applied to silver and silver alloys (such as sterling), to create rich browns and grays associated with age. The first variation, kin- furubi ( kin means gold) creates a rich amber patina and the second recipe below, gin- furubi ( gin means silver) achieves colors that transition through gray to black. The traditional kin- furubi recipe is a mixture of pure gold and aqua regia , a potent acid that dissolves the gold. In the interest of safety, that recipe is replaced here with a commercially available solution that contains the same ingredients: gold dissolved into a liquid solution, mixed with alcohol, which will allow it to evaporate quickly. Gold plating solutions are sold by most suppliers of jewelry equipment. Apply the furubi solution to a clean surface with a paintbrush. Let the object dry, preferrably in direct sunlight. When the piece turns black, rinse the solution off in running water, then rub the work with a paste of baking soda mixed with water to polish raised areas until the desired effect is reached. Rinse with water to check the results. When the results are satisfactory, wash the object in water and set to dry naturally. To prevent oxidation and seal the color, apply a thin coat of clear lacquer. Furubi solutions are used mainly on silver. The following three patinas will produce a black or dark purple color. Process: Immerse the object until the color changes. Remove and wash with baking soda. Dry with a soft cloth and apply wax to seal the patina. Process: Apply with a brush or by immersing the work until the color changes and follow the finishing procedure as above. Process: Apply with a brush or by immersing the work until the desired color is achieved. To finish, polish with baking soda and seal with wax. When using furubi solutions containing strong acids, wear eye protection, rubber gloves and work in a well-ventilated area. Always wash your hands and work area thoroughly after using the solutions. Purchase your own copy of “Japanese Patinas” today. All rights reserved internationally. Copyright © 2004 Brynmorgen Press Users have permission to download this information and share it as long as no money is made. No commercial use of this information is allowed without written permission from Brynmorgen Press. To date 21,129 people have contributed questions and answers to the Orchid Community over the past 20 years and counting.